Sonia's Smile01535 647776work Shop - GiftSonia's Smile is a fairtrade stockist, they have a wide range of clothing for men, women and children, from shirts to jackets, hats and scarves. They also have a range of hand crafted items, fairtrade food such as tea, coffee and chocolate, recycled items and alpaca knitting wool. Sonia's Smile is a fairtrade stockist, they have a wide range of clothing for men, women and children, from shirts to jackets, hats and scarves. They also have a range of hand crafted items, fairtrade food such as tea, coffee and chocolate, recycled items and alpaca knitting wool. Sonia's Smile was inspired by a photograph of a Peruvian girl with a wonderful smile. 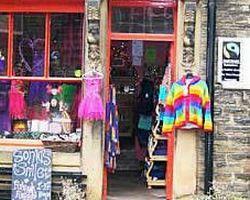 The village of Haworth is now twinned with Machu Picchu Pueblo in Peru and is also a FairTrade Village. The shop is a member of the British Association for Fair Trade Shops and most of their stock is from companies on their approved list of suppliers. Please phone if making a special trip to the shop to be advised on opening times for a perticular day.